Final Fantasy XV has had a very long road to release, but the wait is almost over with a little less than two weeks to go. However, Square Enix wasn’t feeling entirely confident that the game would sell to its potential in Japan, so they created a brand new demo based on the retail build of the game and released it exclusively in Japan to try and win over as many skeptics as possible. And as you can imagine, its Japanese exclusivity didn’t stop westerners such as myself from getting their hands on it. I had to make a Japanese PSN account a couple of years back in order to play Gundam: Battle Operation which was a Japan exclusive digital only title. And it served me well here, allowing me to grab the demo the moment it went up and try the game before it releases(Not that I was going to be persuaded NOT to buy it of course. I’ve had it pre-ordered since April and nothing can kill my hype at this point.). So here are my thoughts laid out in sections for you. 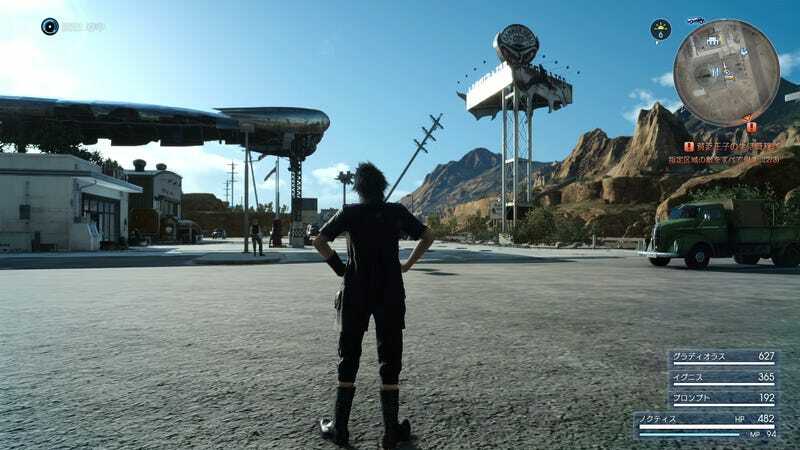 The gameplay of Final Fantasy XV has evolved quite a bit from the past two demos. Episode Duscae featured a battle system that was somewhat automated and kind of clunky. Platinum Demo was a tech demo masquerading as a gameplay demo and came up short because it lacked the other members of your party. Judgment Disc, however, is the complete gameplay package. From the moment the game starts, it drops you into its vast, seamless, open world, free to explore every last nook and cranny of the Leide region to your hearts content. As you explore this desert region you’ll find various knick knacks scattered around that you can sell at stores for gil. In fact, this is about the only way you’ll accumulate gil, at least in the demo. Defeating the various enemies that randomly spawn in the world will yield no gil, just experience. So you’ll need to either complete mobhunts or find and sell these scavenged items in order to make the money you need to perform a variety of tasks. Blue items tend to be the ones you can sell, though how much they’re worth varies considerably. Purple items, on the other hand, tend to be far more valuable and are of course rare. As far as earning experience goes, don’t expect to be leveling up at the speed of light. Your average mob typically yields 50 or less experience points depending on their level. The highest I’ve seen a common mob go up to is lvl7, and the party starts at lvl5. Mobhunts, of course, put you up against stronger enemies and thus a higher experience yield as well as the aforementioned gil. There are about 6 mobhunts in the demo, with the strongest being a lvl15 enemy. Now, if you’re real determined to level grind, you can wait for the sun to set. When night falls, daemons will begin to spawn, replacing the common mobs. Daemons only spawn at night and are the strongest enemies in the demo(And the final game of course.). They consist of lvl15 Bombs, lvl30 Iron Giant’s, and lvl42 Red Iron Giant’s. Even at lower levels Bomb’s aren’t very intimidating to fight. A single Iron Giant is tough, but not impossible. However, two or more Iron Giant’s can wipe the party in under two minutes. A single red Iron Giant, which wields a fire sword, will wipe at least Noctis with a single strike. If you hope to survive these encounters and earn the big experience, it’s best to stock up on healing items and practice dodging and parrying as they’re essential to defeating the Iron Giant’s. Now, once you’ve accumulated as many experience points as you desire, you can cash them in by resting at either a campsite, trailer, or inn. It will tally up each characters XP, add any additional bonuses, and then you watch as the level progression bar fills up. If you decide to rest at a campsite, Ignis can prepare a meal using ingredients you’ve either found out in the world or purchased from a store. Each meal has its own set of buffs which will last for the majority of the next day so choose what fits best for how you plan to play. Resting can also be used as a way to avoid the night entirely as no matter when you rest, it’ll skip to the next morning. If you’re determined to go hunting at night, then you need to wait patiently for the sun to set and not rest. Of course, your buffs will have worn off by then, but luckily you can purchase meals from diners, allowing you to change your buffs or acquire buffs whenever the need arises, for a fee of course. One last note about resting: When you rest, you’ll be shown a total of ten photographs that Prompto took between rests. If you like one of them, you can save them, if not, then you can simply browse and then back out to move onto the next day. It’s a neat little feature that adds to Prompto’s character since he’s intent on cataloguing their road trip, even in dangerous situations. Up to this point I’ve been focusing on a variety of details regarding the gameplay, but I haven’t touched on the main part: the combat. So I’ll do that now. Final Fantasy XV has, in the past, been accused of being a “Hold X to Win” game. That is not true. Sure, if you hold down X, Noctis will auto attack, but that won’t save you from when another enemy pounces on you. It leaves you wide open. The game is meant to be played with caution. You have to dodge and attack at the opportune times to get the best combat score. The higher your score, the more XP you get from that particular skirmish. The score is broken down into three sections: Parrying, Back-Attacks, and Offense. Nine times out of ten you’ll earn an S-rank in Offense because you’ll find yourself wailing on weaker enemies. Back-Attacks only crop up so often and Parrying isn’t as simple as it may seem. You have to hit the block button at just the right time for the parry to connect. If you just hold it, Noctis will either dodge the attack or be hit by it. It’ll take some practicing to get the timing down and when you do, you’ll be better prepared to fight the daemons of the night. As for normal attacking, Noctis can equip up to four weapons, each one mapped to a segment of the D-Pad. You can switch your weapon on the fly if a specific enemy is weaker to, say, a greatsword. And since Noctis can use any weapon in the game, it’s all about preparing yourself. If you’re like me, you’ll have normal weapons in three of the slots, and keep the fourth open for magic. In the early game, magic is found naturally in the environment, typically around campsites. You collect the fire, ice, and lightning magic and then turn that magic power into a usable spell which manifests as an orb and is thrown sort of like a grenade. Contrary to popular belief, you don’t actually have to aim the spell. If you simply lock-on to an enemy and hit the attack button while the spell is selected, Noctis will throw it at the target with a near instantaneous effect. Ice will slow enemies in their tracks, if not outright stop them, fire will burn whatever it touches including the party and will continue to spread for a bit, and lighting will strike the spot where it’s cast. Unlike previous Final Fantasy games, spells also react to the environment. If it’s raining, fire will cause less damage and actually be put out a lot faster, but if used on a sunny day in an area that’s hot then it’ll cause even more damage and spread farther. Ice and lighting work similarly. Lightning is best cast when it’s cloudy and/or raining as it enhances the power of it. Ice is best used in places that aren’t warm or sunny because the ice will melt faster if it is. And for those of you worried that traditional spells won’t be in the game, fear not. While it isn’t in the demo, the full game will feature Ring Magic, which includes stuff like Death and is cast normally rather than like a grenade. And lastly, I do feel the need to mention Wait Mode. As just about everyone should be aware, Final Fantasy XV is the first mainline title to be an ARPG. All previous titles were some variation on turn-based. For those who were finding it tough to adjust to a more action-oriented gameplay style, Square added Wait Mode, which allows you to pause the action and analyze the action. I believe it also allows you to tell specific party members which enemies to attack, but I can’t tell you for certain as I don’t think it’s in the demo. If it is, I haven’t figured out how to use it yet. Sorry, that wasn’t quite the last thing. This is an addendum that I came back to add. The Regalia, your car, does need to be maintained. If you crash into other vehicles(Which games tries to stop you from doing, but can’t entirely prevent.) the Regalia will become noticeably and increasingly damaged. This damage can only be repaired by returning to Hammerhead and speaking to Cindy. The Regalia will also need to have its gas tank filled up from time to time depending on how much time you spend on the road. Luckily, it only costs 10 gil for a full tank. And let it be known for all your reckless drivers that you can’t go offroad. The driving is very much on rails. You can speed up, slow down, pull over, make a U-turn, etc., but you cannot deviate from the roads. It will also try to pull you back to the proper side of the road if you happen to be driving on the wrong side, but as long as you keep the car straight, it can’t do anything about it. Final Fantasy XV has a pretty in-depth customization system for not only your party, but also the Regalia and Chocobo’s. For your party, you can change their outfits whenever you want and each outfit has its own unique advantages and disadvantages. I’d love to tell you what they are, but sadly the demo is entirely in Japanese and as a result I can’t read the descriptions. Sorry. But it should be comforting to at least know that the changes aren’t purely aesthetic. And for those of you who weren’t fond of the parties all black attire, be at peace knowing their default alternate outfits are not monochromatic. Personally I don’t mind because I think it looks cool, but to each their own. There are other outfits to be found or bought in the game, not sure about the demo. The Regalia, your primary mode of transportation across the world of Eos, is all aesthetic, but highly customizable. You can change it’s paintjob, the color of the leather seats, the tires, patterns, even add stickers. Make it your own. Mine has a 2-tone paintjob of black primary and blue secondary with black seats. It was beautiful. And I guess this should also go under this header. Final Fantasy XV features it’s only version a Skill Tree known as Ascension. In this menu, you spend AP to unlock new abilities for each member of the party. There are more trees than just four though, most of which are for Noctis exclusively, while some are shared. Since I can’t read Japanese, I can’t tell you what any of the abilities do and I can’t tell what the trees are. I can simply tell you that how the characters develop is entirely up to you. While the audio and subtitles are all in Japanese, the development teams efforts to make the characters act like real people does not go unnoticed and can, in its own way, convey things about the scene even when you can’t understand the dialogue. For example, in the games intro pre-rendered cutscene, one of probably only a few in the entire game, there’s a moment where, when Noctis is speaking to his father, his eyes dart off to the side, as if he’s just going through some royal routine that he isn’t particularly interested in. He displays annoyance or reluctance in his body language. You don’t need to understand the dialogue to see that. Judgement Disc is comprised of the entire first half of Chapter One which will clock in at about an hour to an hour and a half depending on how you much you rush the main quest. If you’re intent on doing every last little thing and leveling as high as you can, the demo can easily take you far longer than that. I’ve already logged about 6 to 8 hours myself because I’m enjoying it that much. Prince Noctis of Lucis, along with his three closest friends, is sent by his father King Regis to the city of Altissia in Accordo to prepare for the Prince’s marriage to Princess Lunafreya of Tenebrae, as part of the peace treaty terms with the Empire of Niflheim. Shortly after leaving the Lucian capital of Insomnia, their car breaks down and they must take it to Hammerhead Station for repairs. And that about sums it up. For those of you wondering where Kingsglaive: Final Fantasy XV and Brotherhood: Final Fantasy XV fit into this little story, fear not, as neither are required viewing. Kingsglaive takes place concurrently with the first half of Chapter One and gives you insight into what happens in Insomnia after Noctis leaves. Brotherhood, on the other hand, gives backstories to each of the characters, which are supposedly referenced in-game, hence them not being required viewing. That being said, Brotherhood is free to view on Youtube with the sixth episode being the only one not available publicly, but the exclusive scenes can probably be found on Youtube anyway. So really there isn’t any excuse not to watch them. Viewing these two pieces of media will of course enrich your experience with the game just as with any supplementary material. The demo also does a good job of conveying each characters unique talents thanks to the game giving each of them a hobby. Prompto loves photography and will take pictures at any opportunity, which you can view when resting. Leveling up his photography skill will give him access to new filters that will alter the images he takes as well as make him better at taking photos. Ignis is a chef and as a result is responsible for preparing meals when you rest at a campsite. Each time you rest and he cooks, he’ll gain experience in cooking and unlock new recipes, each with their own status buffs. Gladiolus specializes in Survival. The camping equipment is his and plants you can harvest will appear on the mini-map when you get near to them thanks to him. As for Noctis, his hobby is fishing. If you can find a pond, lake, river, or ocean with fish in it, as well as a pier or some other specific spot, you can go fishing and the fish you catch can become ingredients for meals(Don’t quote me on this one. I’m assuming because I assume there’s no other reason to fish.). You can customize the fishing rod by change the rod itself, the reel, bait, and hook. Each of these hobbies gives each member of your party their own personality and really makes them feel like the real people that Square wants them to be. They have likes and dislikes and they express them. Note: This image is not from the Judgment Demo, it’s from the Episode Duscae demo. The Judgement Disc demo is meant to cover only the first half of Chapter One which takes place in the Leide region. The latter half also takes place in the Leide region. However, Square didn’t put just the Leide region into the demo. Using various glitches, players have managed to escape from the boundaries of the demo area. To the east is the city of Insomnia. You might not be able to go right up to it, but you can find a spot to view it from a distance. And it is quite the sight to behold in all honesty. The whole city is rendered and as a result you get a great view of its skyline which is especially beautiful at night. And to the west is the Duscae region, except it isn’t quite the same as you remember it. The layout has shifted somewhat, but it’s far larger than it was in the Episode Duscae demo and definitely has far more vegitation. I can’t say whether or not there are any activities for you to partake in here as you were never meant to get this far in the demo. An indication of that is the fact that there are some objects that don’t transition from their low-resolution LOD’s. So you can consider it more of a sightseeing trip if anything. A tease of what you’ll encounter in the full game. Of course, that’s if the developers allow it to continue. Square has issued a statement saying that they’ll be patching the demo. While there are some glitches I wouldn’t mind seeing taken care of, I hope they don’t eliminate the glitches that allow you to escape the map and explore these other, honestly more interesting areas. Final Fantasy XV is an admittedly gorgeous game. Throughout its development, the developers have been quite transparent about the shapes its been in, and it wasn’t until earlier this year that the final graphics began to take shape. However, due to a number of graphical glitches in the master version of the game, Square opted to delay the game by two months to incorporate the fixes onto the disc itself, resulting in what we see in the Judgment Disc demo, which is based on retail code. It’s definitely one of the best looking open-world games on consoles, I’ll give it that. The PS4 is obviously the system that it’ll look the best on with the resolution jumping between 900p and 1080p in order to preserve 30fps and from 720p to 900p on Xbox One to achieve the same result. I haven’t noticed massive graphical difference between the two other than clarity, but the PS4 is definitely the better experience. One gripe that I had with the visuals is the aliasing. Just about everyting has some form of it and whatever anti-aliasing the game has isn’t doing much to deter the massive amounts of razor blades. It can be a bit of an eyesore and it looks particularly worse in Prompto’s photo’s which are, for some reason, far more low resolution than normal gameplay. I’m not sure if that was intentional. Vegetation is also a bit sparse, even on the PS4 and some of the textures appear blurry or low resolution. Did I mention the aliasing is an eyesore? Square Enix decided that, rather than use the traditional mesh strips for hair, they’d render each strand individually, creating hair that reacts more realistically to things like wind and rain. The downside to such high quality hair is the fact that each individual strand reacts to light and has its own edges causing massive amounts of aliasing and shimmering. The hair practically becomes a blur. Surprise, surprise! 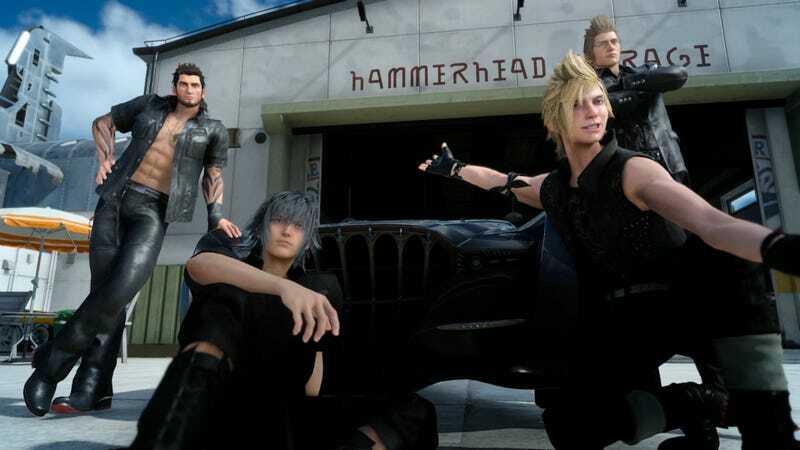 Final Fantasy XV wasn’t really supposed to receive any extensive Pro features until December, but apparently there was some early stuff they felt they could add in time for launch, and it also made it into the demo. The demo features two different modes. The first is lightweight mode which uncaps the framerate to allow it to run higher at the expense of the visuals. A proper 60fps mode is planned for late December and this is the precursor to it. The second mode is High Quality mode. HQ mode keeps the framerate capped at 30fps, opting instead to upgrade the visuals. Included in time for the demo are as follows: Improved Texture Filtering(See above image. Note: These are not higher resolution textures. They’re the same textures, but rendered properly. ), Temporal Anti-Aliasing, Supersampling, denser foliage, higher resolution shadows, improved Ambient Occlusion, and slightly improved lighting. Outside of those two modes is the HDR option. You can switch this on or off regardless of what graphics mode you have selected so long as your TV supports High Dynamic Range. Luckily for all of you, I got a Pro just yesterday, which is why I can comment on both versions of the demo. For you Pro users, I can confirm that the High Quality mode is definitely an improvement over the OG PS4. Whether or not the slight upgrade is worth it to you is your decision to make. It will likely be further improved upon as the weeks go on, this is just the basic version that they have running. I can confirm that the combination of anti-aliasing and supersampling pretty much commits jaggie genocide as aliasing is practically non-existent. Prompto’s photos are still terrible in the resolution department though, and the hair, oh god the hair. It’s only slightly better on the Pro. There’s just way too much going on for the AA and SS to do their jobs on it. But with all the other improvements, I think I can live with that one gripe. That being said, I can’t comment on the HDR function as I do not own a 4K HDR television. I have a simple 1080p display and as a result am incapable of viewing an HDR image. However, I can tell you the impressions I’ve heard from others. Supposedly the HDR implementation is excellent and really brights out the darkness of the nights and makes the sunrise and sunset particularly beautiful, especially by the ocean. Many people, myself included, went into this demo expecting nothing more than a demo. But once you’ve completed the demo, you’re treated to a brand new trailer for the game. Whether it was intended to be the launch trailer or not remains to be seen, but it has yet to be released officially. So the video I am about to link is someone’s recording and as a result is a tad blurry despite the video saying 1080p. If you switch on captions you will get accurate subtitles as well. Fair warning, the trailer is quite a bit spoilery. Many of you might have read all of that and thought that it was more me telling you what the demo is rather than how I feel about it, and you’d be right, I did sort of neglect to actually give you my impressions of the demo, and so I will do that now. I found the combat to be fairly enjoyable to be completely honest with you. The variety of attacks you can perform simply by tilting the analog stick in a different direction is great and being able to switch weapons on the fly is also great. Allies will frequently join you for link attacks and back attacks to do extra damage and you can command a party member to perform a special ability by holding the left bumper and selecting an ability using the D-Pad. When your ally finished performing the ability, it gives you the opportunity to get one final strike in to do additional damage. I absolutely loved this and used it to great effect during hunts and against bosses. It can also save you from a damaging blow because Noctis and the ally performing the ability are invulnerable during the animation. A bit of an exploit I know, but if it works I’ll use it. I haven’t gotten bored of it yet, but considering how long the full game will be, only time will tell. So far I am actually engaged in the story. I’m invested in the characters and I’m really curious to see where the story goes in the full game. It was a small taste of the full thing and while I wish it was longer I can understand why they stopped it where they did. The graphics are fantastic, even if the aliasing gets in the way. Luckily the Pro’s High Quality mode smooths that grievance out... mostly and keeps the resolution at 1080p rather than frequently shifting to preserve the framerate. I imagine the visuals will hold up better once you move out of the Leide region as deserts really aren’t all that interesting. Thankfully, the next region over, Duscae, is green as far as the eye can see. And that wraps it up for this article. If I’ve piqued your interest in the demo, you can grab it from the PS Store using a Japanese PSN account(Plus not required.). If you don’t already have one, there are various guides and/or videos on how to set one up. Once you’ve done that, simply enter the PS Store and search Final Fantasy XV. The demo will show up. It is also available on Xbox, however I am not exactly aware of how you can get it. I imagine it’s a similar method though. And if any of you are worried about breaching the Terms of Service, don’t worry about it, Sony doesn’t care. If they did, you would hear about a lot more people getting banned or something for doing this. It’s perfectly fine so don’t worry about it. Of course, you can also wait another week and a half for the full game, your choice.